I've wanted to make an ice cream cake since last summer, somehow it just never came about so I was determined to do it this summer. To Read More, Click On The Recipe Title. The first thing I had to decided was what shape I wanted and what kind of cake would hold up to being cut into layers and filled with ice cream. I decided on a chocolate pound cake from Joy of Baking. That decision pretty much took care of the shape of the cake as well. Next, ice cream....peanut butter and chocolate, mmmmm. Saveur Magazine had a pb ice cream that looked terrific, decisions made, now to get started! I made the custard for the ice cream the night before and chilled it over night. In the morning I put it into the ice cream maker, it only took about 20 minutes to make, then I froze it. The chocolate pound cake was baked and cooled. When it baked up it had a dome on it so I cut that little bugger off, then put the cake on it's side and cut it into three layers. I took the ice cream out of the freezer to soften up a bit , it had to be soft enough to spread on the layers but still be semi firm. I took the loaf pan that I baked the pound cake in and covered the inside with plastic wrap, I made sure the plastic wrap was long enough on the sides to use as handles to left the cake out of the pan after frozen. I put one layer of cake on the bottom of the pan, then layered with ice cream, another layer of cake and ice cream with the last layer of cake on the top. I wrapped it in plastic and froze it. This was the perfect dessert! Ice cream and cake all in one shot!! You can use a different flavor pound cake and ice cream and come up with your own ice cream cake! It was very well received by my family and that's all I wanted. Chocolate Pound Cake: Preheat oven to 350 degrees F (177 degrees C) and place rack in center of oven. Butter or spray with a non stick vegetable spray, an 8 x 4 x 3 inch (20 x 10 x 8 cm) loaf pan. Line the bottom of the pan with parchment paper. In a medium bowl mix the cocoa powder into the boiling water until smooth. Let cool to room temperature and then whisk in the eggs and vanilla extract. In the bowl of your electric mixer (or with a hand mixer), combine the dry ingredients (flour, baking powder, salt, and sugar) and mix on low speed for about 30 seconds or until blended. Add the butter and half of the chocolate/egg mixture. Mix on low speed until the dry ingredients are moistened. 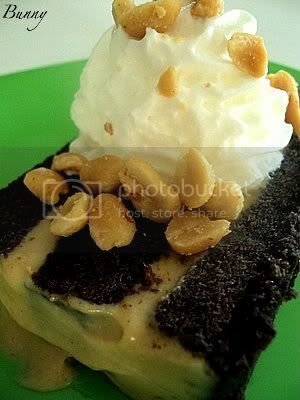 Increase the mixer speed to medium and beat for about one minute to aerate and develop the cake's structure. Scrape down the sides of the bowl. Gradually add the remaining egg mixture, in 2 additions, beating about 30 seconds after each addition to incorporate the egg and strengthen the cake's structure. Scrape the batter into the prepared pan and smooth the top with an offset spatula or the back of a spoon. Bake for about 50 to 60 minutes or until a toothpick inserted in the center comes out clean. Cover loosely with a piece of lightly buttered aluminum foil after about 25 minutes to prevent overbrowning. Remove the cake from the oven and place on a wire rack to cool for about 10 minutes. Remove the cake from the pan, re-invert, and cool completely on a lightly buttered wire rack. Will keep, well wrapped, several days at room temperature, about one week when refrigerated, or it can be frozen for two months. 1. Heat milk in a small saucepan over medium heat until just hot. Meanwhile, beat sugar and eggs together in a medium bowl until thick and pale yellow. 2. Gradually whisk hot milk into egg mixture in bowl, then pour milk–egg mixture into saucepan. Return saucepan to medium-low heat and cook custard, stirring constantly with a wooden spoon, until it is thick enough to coat the back of the spoon, about 5 minutes. Remove saucepan from heat and stir in 1⁄2 cup of the peanut butter. Strain custard into a large bowl, let cool briefly, stirring often, then stir in cream and vanilla. Cover and refrigerate until cold, 6–8 hours. 3. Process mixture in an ice cream maker according to manufacturer's directions, adding 1⁄2 cup of the chopped nuts to the ice cream 30 seconds before it has finished churning. Transfer to a bowl, quickly swirl in remaining 1⁄2 cup peanut butter, cover, and freeze until hard. 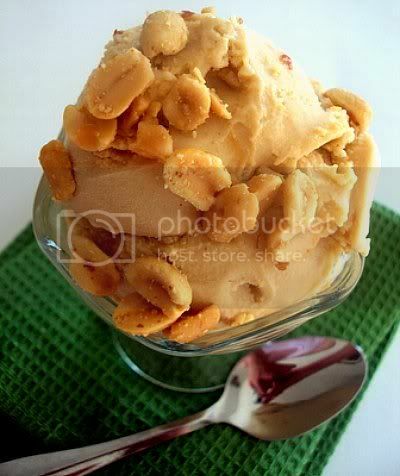 Serve ice cream sprinkled with the remaining 1⁄2 cup nuts. If these were any easier to make, they'd make themselves! The kids will love helping you make these. You could use any flavor four ounce instant pudding you want to. Maybe even mix and match! The molds are so easy to come by, I found mine in the dollar zone of my grocery store. Add pudding to milk, whisk 2 minutes pour into molds and freeze. I filled 2 molds and still had some left over so I poured the remaining mixture into ice cube trays and froze them. It all looks like ice cream bliss to me! Very cool post! (pun intended!) 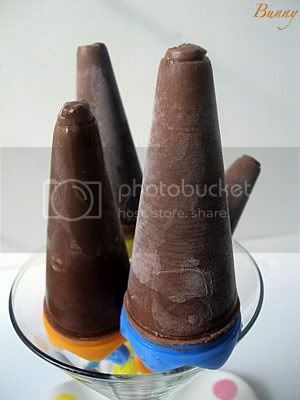 Cute idea to make fudgesicles. Haven't had on in ages! These are all fantastic alternatives for beating the heat ladies!! Wow! Three delicious frozen treats in one post! Great job! They all look so delicious! I'd love to try that ice cream cake recipe! i'm in new england too and i have not been baking in weeks. i want to make ice cream but man it is just too humid to even stand in the kitchen. i am so jealous that you made these creations. perfect. The color of that gelato is amazing! I have been working on some ice cream cakes to lately. Yours look really amazing and the fudgesicle-UM WOW! The blueberry gelato has amazing color. Ice cream!!!!!!!!! 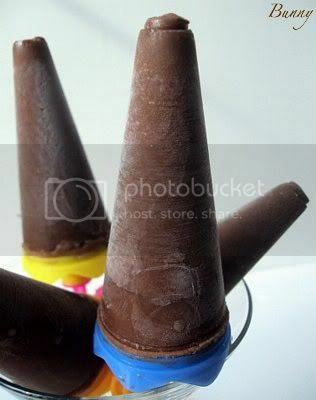 !111 I want ice cream! The heat idex is 110 degress here. Bunny should you cake look any better? I'll answer my own question - NO!!! MMMMMMMM fudgecicles :-)These pictures are great, ladies! I always love your posts! Frozen treats are a definite must here in TX! Yum! I'm going to have to go with the peanut butter ice cream and the fudgsicles on this one! Wow. This is so cool!!! So many choices! My, my, my. Which do I try first?! All are totally irresistible. That all looks wonderful, but I'm really wanting your PB ice cream cake and those fudgcicles. I'm looking to make an ice cream cake soon myself, so you gave me some inspiration! Wow, such a fill post! The ice cream cake is right up my alley. That's what I always request for my birthday! Good Lord, ladies! This post was almost too much for me. 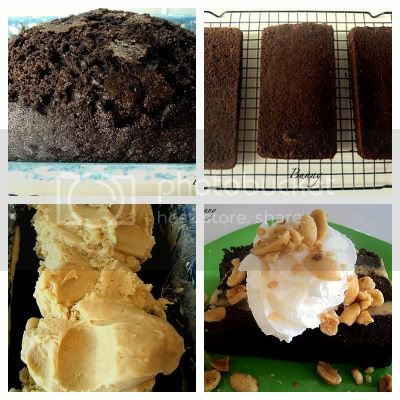 I am overcome with the extreme yumminess factor of these three recipes and your photos! I'd like to dive into all of these treats.